Luke and his team use LivePlan to help clients identify opportunities to increase business efficiency and profitability, identify tax-saving opportunities and develop a strategic plan. In the fall and winter of 2016, LivePlan worked with the CPA firm Gheen & Co. to develop their advising services practice. 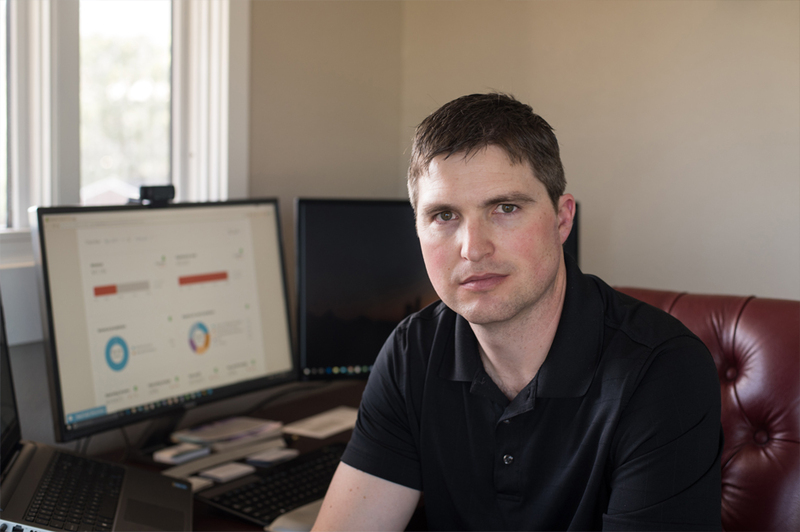 Luke Gheen, the founder and CEO, was looking for a way to grow this portion of his business, and partnered with the LivePlan team to implement the LivePlan Method for Strategic Advising. 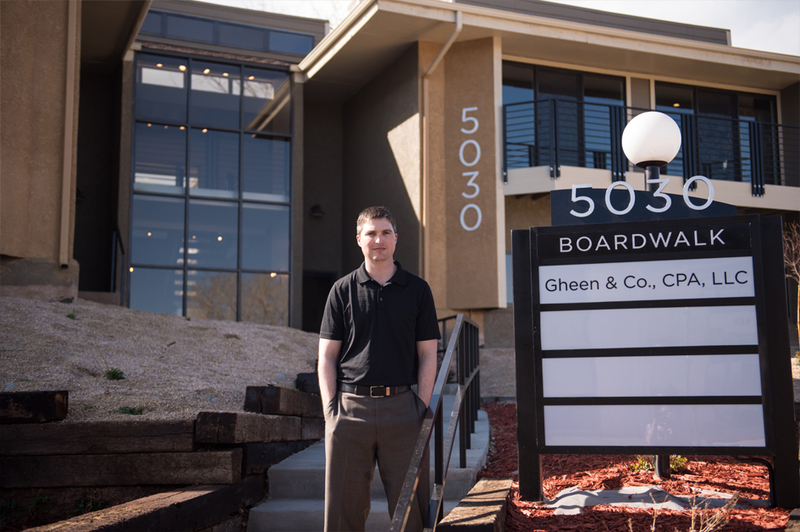 Gheen & Co. CPA is a full service firm in Colorado Springs, CO. They place special emphasis on building authentic client relationships, and they strive to help their clients grow their small businesses. Gheen built his firm with a careful eye to the future, forming strategic relationships and cultivating a willingness to seek advice from peers and experts. Gheen & Co. was already using the most progressive software solutions, but they were struggling to develop a systematic and profitable approach to their client advisory services. They wanted to offer their small business clients the Strategic Advising they knew the clients wanted, to the level they knew they could work, while still making a profit on the service. At that time, Gheen & Co. was staffed by Gheen himself, plus three CPAs. They had about 130 clients and were using LivePlan with about a third of them. They weren’t using LivePlan to its full capacity, just for business plan writing upon client request. However, they had seen a real interest from their clients in terms of planning. They needed a process to deliver Strategic Advising consistently and systematically for all clients. Not only that, but the CPAs needed to be comfortable and confident with the work, and it needed to be scalable. Gheen was using sophisticated, cloud-based software, and had smart CPAs who were experts at executing the standard work that CPA firms do. But they were not trained in the art of business planning and advising. Their strength was providing tax advice and producing month and year end reports and statements in the realm of compliance. Helping clients with business planning seemed beneficial to them if the client was in need of a small business loan, and therefore needed a related business plan, but not for any type of proactive or regular work. We needed to show them why regular, proactive planning would make a huge difference in the level of their advisory services, and eventually the success of their small business clients, which was their ultimate goal. Since Gheen & Co. was smartly utilizing value based pricing, they knew they had to be careful about scope. Adding any additional work that wasn’t included in the fixed fee would eat away the margin. Even though these problems seemed hard to overcome, Gheen knew that the need to provide advising services to his clients was too great to ignore. He had seen, with the light introduction of LivePlan, how eager his clients were to discuss business planning. More and more clients were asking for the service, and his business was growing as a result—but he didn’t have a way to manage it. Gheen & Co. is set up in a standard business organizational structure, with Gheen acting as CEO and general manager and the CPAs as employees. But each CPA still has their own set of clients and and unique methods—their own best practices, so to speak. This can be effective if everyone is on the same page, especially when it comes to compliance work, the methods of which are well understood. When a new service offering is introduced, however—especially something like client advisory services, which has the potential to be open-ended—training and systems must be set up across the organization to provide a framework for the work to occur smoothly. It goes back to the idea of efficiencies and fixed price work. Each CPA needed to be clear on procedures to budget the right amount of time. Too little, and the product will suffer; too much, and margin will be compromised. Gheen knew that with the right systems in place and the right training, he had the potential for a very lucrative addition to his client offerings. His customers wanted it, and so did he. The LivePlan team’s goal was to get them there. The LivePlan team worked with Gheen & Co. off and on during the span of a few months—about 30 hours of work, plus about five hours of on-site training. The LivePlan Method implementation work was centered around identifying a set of work phases and tasks, which allowed the firm to define tasks by time, and then set costs and sell prices against them. The finished product is a natural training manual because it is task-based, but it&apos;s also a way to determine how much the Strategic Advising work will cost, as well as a baseline sell price centered on desired gross margin. Development: customizing the LivePlan Method for Gheen & Co. The following details the outcome by challenge subject. To address the need for standardized work procedures, the LivePlan team worked with Gheen to model the LivePlan Method for Strategic Advising to fit Gheen & Co.&apos;s current business processes. LivePlan provided Gheen with a task list template, and encouraged him to modify it for his business—play with the time allotments, cost rates, and gross margins by phase to come up with a version that would fit his business. Gheen loved playing with the numbers and appreciated being able to truly understand the relationship between margin and pricing. We structured the method to fit into the way Gheen’s CPAs currently work with clients, but also to enhance that work, ensuring that every client could benefit from the firm’s Strategic Advising offering, giving them a platform to take them to scale. Establishing a standard process structure for client advising services resolved the issue of scope creep. The CPAs collectively understood the total time to spend on each phase and associated task in order to make the margins they needed. Because they had been part of the process of developing the procedures for their own company, they felt comfortable with the allotted timeframes. 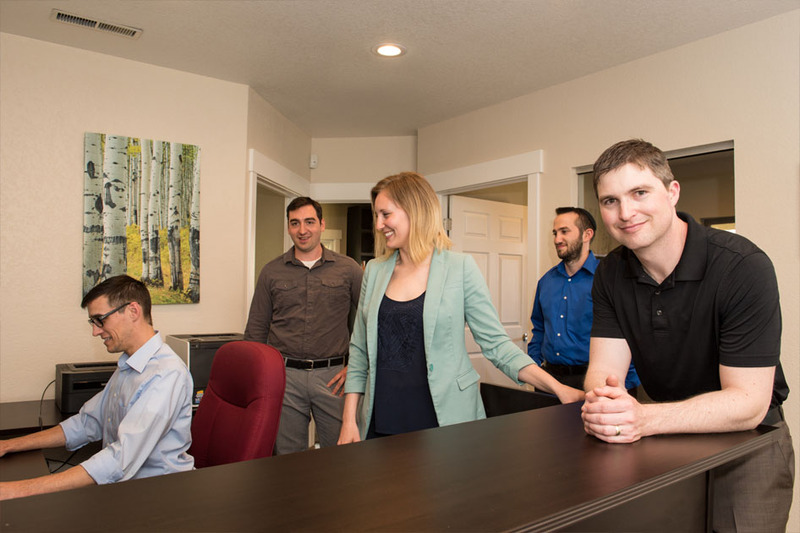 When the LivePlan team came to Gheen & Co. for on-site training, they led the staff in client role playing exercises, ensuring that the CPAs felt comfortable and confident. Most importantly, the CPAs knew where to draw the line with the scope of their advisory services. If the work began to exceed scope, a change order would be proposed to the client. 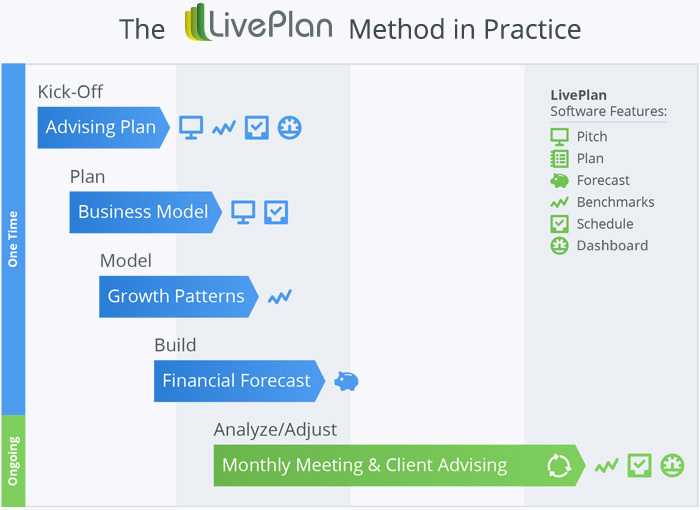 When Gheen & Co. launched the LivePlan Method project, many of the CPAs were skeptical that business planning would be necessary for successful advisory services. After training on the business process and Strategic Advising, the CPAs understood the inherent need for the planning phase. After all, as one of them said during training, “How can we possibly help our clients reach their business goals if we haven&apos;t worked with them in a planning capacity from the beginning?” Indeed! The true definition of Strategic Advising is turning the goals of the client into business strategy, and, with an eye to growth and valuation, developing a plan to reach their goals. Planning is the crucial piece, not reporting. Throughout the LivePlan Method implementation, the Gheen & Co. CPAs approached changes with an open mind. They were willing to consider new ways of doing things, and they spoke up when they had questions or concerns about the process, which ultimately resulted in integrated workflows that the whole team was willing to embrace. After seeing how fully integrated the LivePlan Method process would be in his firm, Gheen shifted his priorities and hired a business planner instead of a new CPA. During LivePlan Method training, he realized that having an employee focused on business planning for his clients would be the best way to ensure the success of his advisory services. His new hire will oversee all of Gheen & Co. business planning and advisory services, and work in concert with the CPAs in the practice, picking up some of the onboarding work they do now. In turn, the CPAs will take on the added accounting work that each new client brings. Each will have a role in supporting their clients holistically. This brings another dimension to Gheen&apos;s offering that is better in keeping with his goal of offering full advisory services, while still supporting the growth of his business. 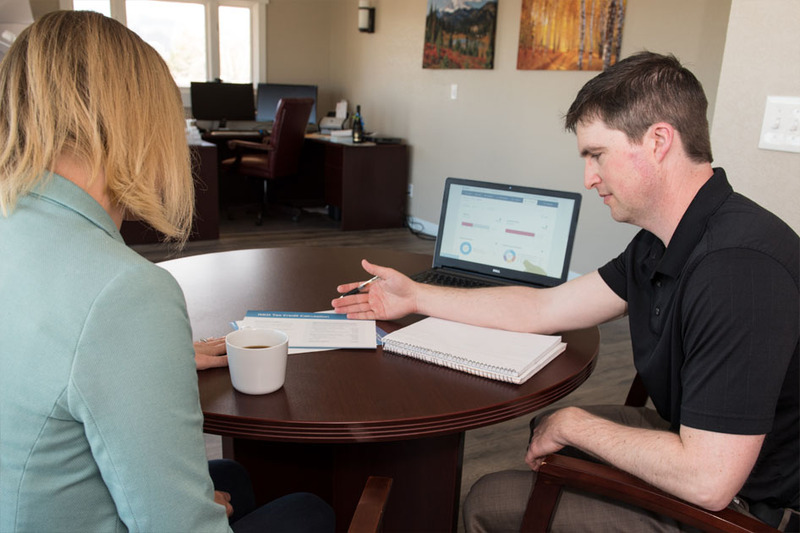 Gheen & Co. CPAs each have a client load of around 60, and they now onboard every new client using the LivePlan Method for Strategic Advising: establishing a proper client kick-off for advisory, then moving into planning and the rest of the setup steps. They perform their monthly check-ins using the LivePlan Method as a framework, and advise the client on their current status and trends related to their goals. Utilizing best practices, Gheen & Co. employees regularly use video for these updates, recording themselves giving the monthly status review, and then email the video to clients with a link to schedule a meeting. It&apos;s a very concise way to deliver a lot of value. For pricing, Gheen uses the techniques and tools from Mark Wickersham and Cloud Pricing to value his advisory services as part of a three tiered selection, with advisory layered throughout. The beauty of the LivePlan Method is that tasks can be easily placed into the tiers that make sense based on the work, and the price and margin targets. Price services to be fair to clients, but to provide margins and profitability for Gheen & Co. Structured method: When offering advising services on a fixed price, it is inefficient to do custom work for every client. Instead, treat the work as a fairly strict scope of services. LivePlan&apos;s framework allows for this, while still generating a unique plan for each client. Built for the small business owner: LivePlan is something your clients will always understand because it is built with the small business owner in mind, not as an accounting tool. As clients progress over time, they will develop a better understanding of how to shape their own forecasts. Since LivePlan is cloud-based, the advisor will benefit from their client&apos;s increasing independence.